The City of Los Angeles has about 8,000 vacant lots, which potentially could be used for urban agriculture. There is plenty of vacant land that could potentially be farmed in urban Los Angeles County, but there are hoops to jump before a hoe can rake through the earth, reported Rick Paulas in a Q&A article with UC Cooperative Extension advisor Rachel Surls, published on the KCET Food Rant blog. The Los Angeles Times today ran a compelling photo in its blog "Framework," which shares intriguing news images of the past, showing men collecting vegetables in payment for labor during the Great Depression. 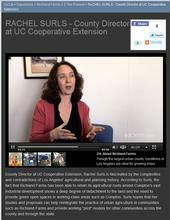 For information on such cooperatives, Framework directed readers to a blog post written by the director of UC Cooperative Extension in Los Angeles County, Rachel Surls, in June 2010. 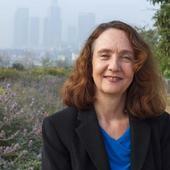 Rachel Surls appears on four "oral history" videos on the Departures website. The public television station in Los Angeles, KCET, has produced a multi-media package on its website that delves into the unique circumstances of Richland Farms, an agricultural district in the heart of urban Los Angeles County.